Emerging with beauty and grace, well-known Utah choral conductor Jean Applonie has ushered the BYU Women’s Chorus into the ranks of BYU’s premier auditioned choirs. 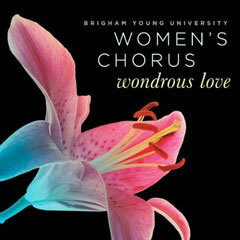 The BYU Women’s Chorus presents its first complete CD with the beautifully executed Wondrous Love. 7. Where Can I Turn for Peace? Words and music by Thomas S. Allen; arr. Clifton J. Noble Jr.
13. How Do I Love Thee?